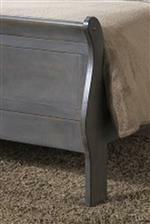 Traditionally designed, this two drawer night stand is a classy way to bring bedside storage space to your master suite. Drawer fronts are decorated with beautiful hardware pulls, offering a lovely contrast against the rich woodwork. The piece features traditional moldings, a square shape, and a roomy top that provides plentiful space for placing home accents, decor, or bedroom accessories. Simply styled with an upscale appeal, this night stand is the perfect piece to add extra storage space and traditional style to your bedroom. The 4934A 2 Drawer Night Stand by Lifestyle at Beck's Furniture in the Sacramento, Rancho Cordova, Roseville, California area. Product availability may vary. Contact us for the most current availability on this product. Storage Two drawers with pulls and a spacious top.